AWRENCEVILLE, Ga. — The chimpanzees at the Yerkes National Primate Research Center were acting up. Jessie, a pink-faced 20-year-old, slapped her ample belly and hooted wildly from behind a steel gate. Dover, a mischievous 4-year-old, spied an unfamiliar human and served up his standard greeting for strangers, a fistful of feces, pitched with remarkable accuracy. Jessie and Dover do not really have to be at Yerkes, but there is nowhere else for them to go. Bred for biomedical research, they are now unemployed, a result of a vast surplus of laboratory chimpanzees. They pass their days in small steel-and-concrete enclosures, playing with burlap bags and shredding old telephone books for entertainment. But there may be better times ahead for these great apes and hundreds of their captive kin. Acting on a mandate from Congress, the National Institutes of Health announced last year that it would spend $24 million to help build and operate a chimpanzee sanctuary, in essence, a taxpayer-supported retirement home for research chimps. "It's a good moment for chimps, a very good moment," said Dr. Frans de Waal, a Yerkes primatologist who is on the board of Chimp Haven, the organization that received the contract for the sanctuary. "If we are not going to use them for biomedical studies, let's move them to a situation that is attractive to the chimps for retirement." Of the 1,600 laboratory chimps in the United States, N.I.H. officials estimate that more than 400 are not involved in experiments. Chimp Haven, which officials hope to open in 2004, will be on 200 acres of donated land near Shreveport, La. It may eventually be home to up to 300 chimps. Others may retire to a private sanctuary in Florida. Some scientists, however, including Dr. Stuart Zola, the Yerkes director, fear that the federal government is setting a bad precedent by giving its imprimatur to the retirement concept. "I see the retirement community idea as simply another ploy by the animal rights community to reach their eventual goal of abolishing the use of animals in research," Dr. Zola said. "I'm not opposed to it. But I think it is being driven by an animal rights point of view." Advocates for animal rights are angry because the legislation that authorized the sanctuary included a provision permitting the animals to be returned to laboratories in a public health emergency. "They cannot call a place a sanctuary if what it really is is a holding pen for when they need the chimps the next time," said Holly Hazard, executive director of the Doris Day Animal League, a lobbying group in Washington. Still, Ms. Hazard said, "Any day the chimps have enjoying the sunshine is one day more than before." The surplus is an unexpected legacy of AIDS. 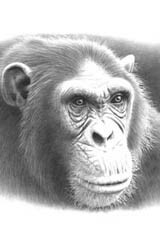 In the early days of the epidemic, scientists theorized that the chimp would be a useful model to study the disease in people. In 1986, the health institutes began an aggressive breeding program that doubled the laboratory chimp population, only to find that although chimpanzees could contract the AIDS virus, they rarely became sick from it. That distinction makes it hard to use the animals to test treatments or vaccines. With their striking genetic similarity to people - chimps and humans share the same blood types, and their DNA is more than 98 percent identical - the apes are attractive to scientists. The vaccine for hepatitis B, for instance, was developed in chimps, and they are still used to study hepatitis C and malaria, among other diseases. Moreover, Dr. Zola said, the scientists who mapped the human genome are now planning to do the same for chimpanzees, an effort that may make the apes even more valuable to science. "They may provide us with very important information," he said, "about what makes us human." The similarities have also created a growing sentiment, even among scientists, that chimps, the only great apes still used in medical research in the United States, should not be treated like other lab animals. In 1997, a panel of scientific experts said reducing the chimp population by euthanizing excess apes would be unethical. Citing the genetic similarities, the experts said the government had "a moral responsibility" for chimpanzees' long-term care. The report prompted Congress, in 2000, to pass the law that led to the sanctuary. "They are animals that have powerful emotions and powerful intellects, and it is really quite inhumane to keep them contained in little enclosures," said Representative James C. Greenwood, the Republican of Pennsylvania who sponsored the bill. The sanctuary, Mr. Greenwood said, will allow the chimps to "feel comfortable and socialize as repayment for all the service they have rendered to science." With life spans of 50 years or more, some chimps may outlive the scientists who do research on them. Big and strong, they are expensive to maintain. Yerkes, which has 174 chimps at three locations, budgets $500,000 a year for their care. In addition to housing and veterinary care, the apes also need activities. Federal regulations demand "enrichment programs" for captive primates, whether or not they are used for experiments. At Yerkes and elsewhere, experts say, television is a favorite entertainment. "There are some that like soap operas," said Dr. Linda Brent, a behavioral researcher and director of enrichment at the Southwest Foundation for Biomedical Research in San Antonio. "I knew one named Sammy. He liked to watch Barney. Sometimes, they like shows like Jerry Springer, because it looks like the people are fighting. They like the action." In 1993, while completing a doctoral dissertation on the development of infant chimpanzees, Dr. Brent visited Gombe National Park, near Kigoma, Tanzania, where Dr. Jane Goodall has studied chimps for more than 40 years. "It was a life-changing experience," she said. Two years later, Dr. Brent founded Chimp Haven. Relocating the chimps will not be easy, she added. Chimps reared apart will have to be carefully introduced to one another, a process that could take months. "Biohazardous" apes, those that carry infectious diseases, will be the last to move. Nearly all research chimps in this country were born in captivity. Dr. Brent said she intended to push the labs to quickly retire the remaining apes born in the wild. She hopes they will pass on their knowledge to chimps born in captivity. "We'd like to see them in a place where they can use their smarts," she said. "They know how to build nests. They know how to search for termites. They know the things they need to do to live in the wild. I think we have a really unique opportunity to help the chimps become chimps again." Although the Chimp Haven sanctuary will be the only one with taxpayer support, it will not be the first of its kind. Three years ago, the Center for Captive Chimpanzee Care opened a sanctuary on 190 acres near Fort Pierce, Fla., with 20 former Air Force chimps that were descendants of the "chimponauts" that flew into space in the 1950's. "I've never worked with chimps more screwy, more altered, more disturbed than these chimps," the director of the center, Dr. Carole Noon, said. "Each one came in with some kind of crazy behavior." In September, the center took over a colony of 266 chimps and 61 monkeys that had been maintained by the Coulston Foundation, a private laboratory in Alamagordo, N.M., whose checkered history included citations by federal animal welfare officials for mistreatment of chimpanzees. Eventually, Dr. Noon said, she hopes to retire the Coulston apes to Florida. At Yerkes, the nation's oldest primate center, about 100 chimpanzees, including nine infected with the AIDS virus, live in the biomedical research compound in Atlanta, which is off-limits to reporters. An additional 20 are in New Iberia, La., and 55 are here in Lawrenceville, at a 117-acre field station where Dr. de Waal studies their social behavior. The 40 or so apes in his studies are clearly the more fortunate ones. They live in two separate spacious outdoor yards, each with playground equipment for swinging and climbing. On a fall morning, they lolled about in the sun, grooming and picking nits from one another's fur. Dr. de Waal, who studies how chimps fight and reconcile, has been teaching them to use a joystick to identify pictures on a computer screen. Jessie and Dover, however, are not part of the behavioral research, and despite their unemployment, they are not likely to be among the first Yerkes chimps to relocate; Dr. Zola, the Yerkes director, said the New Iberia chimps will probably move first. While Dr. Zola said he would love to build similar large outdoor enclosures for Jesse, Dover and other unemployed apes, the hard reality is that he has neither the space nor the money to do it. Of their current living situation, he said, "It isn't optimal." A Hybrid? Or a New Species of Ape?